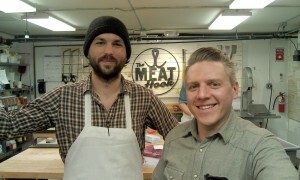 The Meat Hook is a whole animal butcher shop located in the Brooklyn Kitchen and it will soon launch a sandwich shop. Brent Young and Ben Turley have developed the business out of their desire to take traditional lunch meat, such as ham or roast beef, up a step and make high quality sandwiches. Last October, Brent and Ben reached out to Evergreen to help put an application together to get financing from NYBDC to fund build out of their space (495 Lorimer Street) and provide some measure of working capital. We were able to help them with their business plan, financial projections, and other application documents. The Meat Hook Sandwich Shop successfully closed on a $100,000 loan at the end of January. We were happy to help te Meat Hook Sandwich Shop secure funding, as the Meat Hook Butcher Shop and Brooklyn Kitchen have been highly supportive members, particularly for our food initiatives. They host Evergreen’s monthly Food Manufacturing Growth Fund seminars, which support a variety of burgeoning food and beverage companies in the area. The Meat Hook Sandwich Shop should be a great addition to the scene.